The Denair Unified School District is in growth mode again, a fact plainly reflected in the 2017-18 budget passed unanimously by trustees Thursday night. The $16.2 million spending plan projects the use of more than $1 million in so-called “one-time funds” received from the state over the past few years. Most of that money will be directed to new buildings on the fast-growing Denair Elementary Charter Academy campus, new textbooks at all four campuses, and computers and other technology to better prepare those students. The budget also reflects a $500,000 Clean Energy Grant received from the state. That money will pay for the energy-efficient lighting and a heating and air conditioning system installed this week at Denair Charter Academy. It also will fund new LED lighting at the Denair High gym and at about half the classrooms there and at Denair Middle School. DECA must add two classes each year for students in the dual-immersion program, which teaches children in Spanish and English. It started at the kindergarten level in 2015-16 and expands to each grade level as the first students advance. Covello said about $415,000 will go toward purchase and installation of up to 10 portable classrooms at DECA in time for the 2018-19 school year. Another $430,000 will be directed toward the purchase of new textbooks in Spanish, English language arts and math across the district, Covello said. About $120,000 will be used to replace two computer labs at DECA and $100,000 will buy eight to 10 Chromebook carts (portable computers used across the district). “It’s exciting that we’re updating so many things,” said Trustee Ray Prock Jr. Fast-growing Denair Elementary Charter Academy will add classrooms for its expanding dual-immersion program and students across the district will benefit from new textbooks under a proposed 2017-18 budget discussed Thursday night by school officials. The $15.7 million spending plan projects the use of more than $1 million in so-called “one-time funds” received from the state over the past few years. Linda Covello, chief business officer for the Denair Unified School District, said about $415,000 will go toward purchase and installation of up to 10 portable classrooms at DECA in time for the 2018-19 school year. The elementary campus must add two classes each year for students in the dual-immersion program, which teaches children in Spanish and English. It started at the kindergarten level in 2015-16 and expands to each grade level as the first students advance. Another $430,000 in the proposed budget will be directed toward the purchase of new textbooks in Spanish, English language arts and math across the district, Covello said. About $120,000 will be used to replace two computer labs at DECA and $100,000 will buy eight to 10 Chromebook carts (portable computers used across the district). “We really want to expand our programs to entice students to come to the district,” Covello said. The one-time funds have accumulated the past three years, she said. By law, they cannot be spent on ongoing expenses such as employee salaries. Superintendent Aaron Rosander said rather than increasing overall funding for education, Gov. Jerry Brown has preferred to give districts one-time funds if the state has “extra” money at the end of its fiscal year. 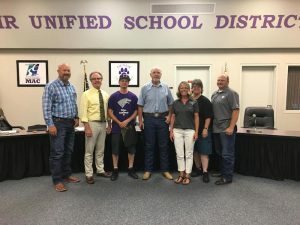 An emotional meeting of the Denair Unified School District board that lasted well past midnight ended with the announcement that four certificated employees will not return for the 2017-18 school year. Two of the employees submitted resignations that were accepted. Two others still on probation were told their contracts would not be renewed. Certificated employees can be teachers or administrators. Under the California Education Code and union agreement, teachers with less than two years’ experience in a district must be notified by March 15 each year whether they will be released. With that in mind, more than 100 students, parents, teachers and community members gathered beginning at 6 p.m. Thursday in the board meeting room. Over the next 90 minutes, the five DUSD trustees listened to expressions of support for individual teachers. Because personnel issues were involved, trustees and district officials could not respond. The board took a short break at 7:45 p.m., then returned and heard from a few more audience members. Then, trustees spent the next 2½ hours dealing with their regular agenda, including accepting a financial report that shows the district continues to improve its position thanks to enrollment growth. About 10:12 p.m., the board went into closed session. Trustees emerged about 12:07 a.m. and announced the personnel decisions to the 30 or so people who had waited. The vote was 4-1, according to board President Kathi Dunham-Filson. She joined Trustees Ray Prock Jr., John Plett and Sandi Dirkse to support the motion related to the four certificated employees. Trustee Robert Hodges voted against it. 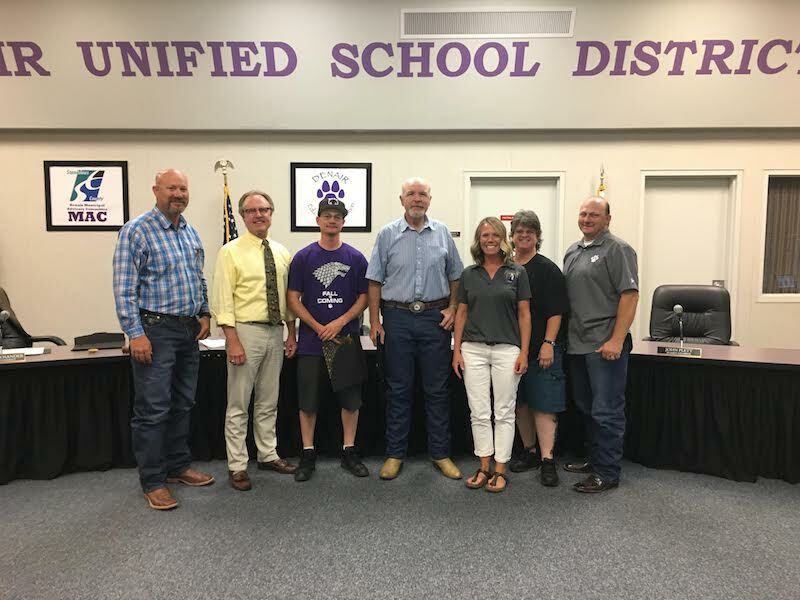 With little comment and cautious optimism for the future, Denair Unified School District trustees unanimously approved a $13.5 million budget for the 2016-17 school year Thursday night. The new budget includes 1% salary increases for all employees, one-time investments in technology and academic programs, additional state-mandated contributions to retirement plans and two new teachers at Denair Elementary Charter Academy to expand the dual-immersion Spanish language program. “What a change we’ve seen in our budget the past three years,” said board President Sandi Dirkse. In 2013, the district was on the verge of state takeover because of its precarious financial position. It slashed salaries for all employees 8% and needed loans from the Stanislaus County Office of Education to balance its books. Those difficult days are behind DUSD now, though continued enrollment declines at Denair High School have offset gains made at its two charter campuses – DECA and Denair Charter Academy. Linda Covello, the district’s chief business officer, said next year’s budget has an ending balance of $3.3 million, which includes about $600,000 in restricted funds that only can be spent on one-time projects. Unanimously approved 1% salary hikes for Superintendent Aaron Rosander and Covello. They were the final two employees who had not yet received raises. Agreed to shorten administrators’ schedules from 220 to 210 days per year. Teachers and classified staff – both represented by unions – are contracted to work 180 and 200 days, respectively. Adopted Local Control and Accountability Plans (LCAP) for the district and each of its four campuses. They are three-year overviews of specific academic and programming goals and how the district will pay for them. They were formed with input from the community as well as staff members.